The discovery of a new ritual pool under the Western Wall suggests a new theory that the Kotel was completed later than thought. 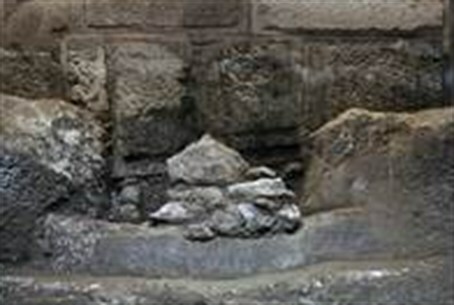 The discovery of a new ritual pool [mikveh] under the Western Wall suggests a new theory that the Kotel was completed years later than during the reign of King Herod, as was believed until now. Israel Antiquities Authority excavations of an ancient drainage channel underneath the main street used by pilgrims 2,000 years ago revealed the ritual pool. The excavations beneath the paved road exposed sections of the Western Wall foundations. Dr. Donald Ariel, a native of the United States, said the coins that were discovered in the area were struck by the Roman procurator in the years 17-18 in the Common Era, meaning that Robinson’s Arch, and possibly the longer part of the Western Wall, were built no sooner than a year later – 20 years after Herod died. The Antiquities Authority said that building the walls of the Temple Mount and Robinson's Arch was a huge project that lasted for decades. "This dramatic finding confirms the descriptions of Josephus that the work was not completed until the time of King Agrippa II, the grandson of Herod.” Archaeologists added that the completion of the Western Wall left up to 10,000 people unemployed.